Sometimes the scariest part of the Thanksgiving Dinner is the worry that the turkey will not turn out properly – undercooked, overcooked, dry, flavorless – and ruin the whole meal. I’ve cooked in bags, roasted, braised, fried, deboned – about everything but brine. I’m not a fan of brining. And still every year I worry. I tryout various new methods a few days before the big day, just to spice things up and make sure there are leftovers in my frig. This year I decided to try removing the backbone and flattening the bird, cooking it at a high temperature for a shorter cooking time. It seemed like it was pretty foolproof and stress free. My brother is going to prep one of his two turkeys similarly, but smoke it instead. I put it together today so I could get the recipe up in time for your holiday. BTW, my recommendation is to always get two smaller birds instead of one massive bird – you’ll have a much better outcome with shorter cooking times. Not to mention not having to worry about fitting a huge bird in the oven. We usually do an oven bird, then grill, smoke or fry another. 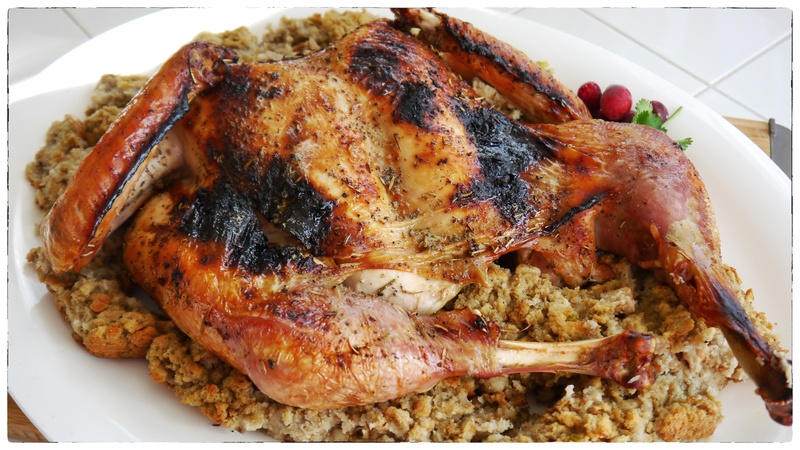 For this recipe, a good set of poultry shears makes quick work of removing the backbone. I prepped the bird yesterday, wrapped it up and refrigerated it. This gave me time to make a nice broth from the backbone, giblets and neck last night (see notes below) and make the cranberry sauce, because it’s always better the next day. In a spice grinder or with a mortar and pestle, crush together pepper, salt, sage and rosemary and add to brown sugar. Set aside. With a sharp knife or scissors, remove the back bone of the turkey, flip over and press down on the breast bone to break and flatten. I wasn’t quite strong enough, so I turned the bird over, scored the bone, flipped it back and tried again, this time it broke easily. I then trimmed off the wing tips. See my notes below on what to do with the back and wing tips. Place the bird flat, breast side up, on the rack in the baking sheet. Rub with spice mix and let rest at room temperature for 30 minutes. Preheat oven to 450 degrees. Before cooking drizzle olive oil over turkey and roast for 1 hour or until the temperature of the thickest part of the breast reaches 160 degrees. 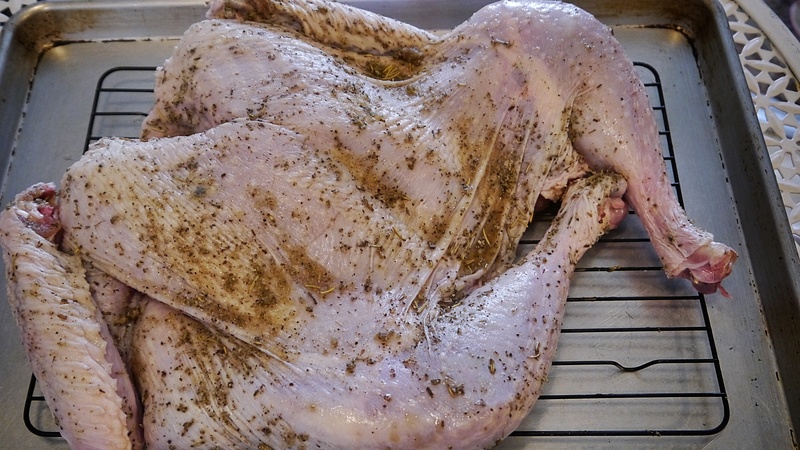 Remove from the oven, tent with foil and let rest for 30 minutes (during this time the bird temperature will reach 165 degrees and thighs should be 175 degrees). NOTES: I took the back, wing tips, neck and giblets, covered them with water and simmered them for about an hour. I then used the broth for both the stuffing and gravy. I also cooked the stuffing in the oven, in a baking dish, uncovered, with the turkey. They finished up about the same time. The next time I make this, I would forego the metal rack and instead use a roasting pan and place the bird on a bed of carrots, celery and onion. With the shorter cooking time, the flavor could use the boost. I do feel this is a great technique for wood grilling or smoking. More Recipes: We have a bunch, a peck, a bushel, of Thanksgiving recipes, including my favorite Upside-Down Cranberry Cake (here), No Boil Mashed Potatoes (here), and Non-Traditional Sides (here), click on this link for all the other recipes or search by name or ingredient in the search box at the bottom of the blog. Thank you – I’m planning to do the spatchcock thing and appreciate your list of lessons learned. Thanks for stopping by. Hope it turns out great.